With the 4th of July only a few days away, I though I’d post a review of an Independence Day set horror flick. Too bad I don’t have a better one to offer, as this flick just didn’t do it for me. Barry Levinson directs… from Michael Wallach’s script… this found footage horror about the small fictional town of Claridge, Maryland that sits on Chesapeake Bay and comes under attack from a vicious flesh-eating parasite that starts to rabidly spread through the populace. Can it be stopped or, will all those quarantined in this bayside town fall victim to this horror possibly spawned by toxic elements dumped into the bay. 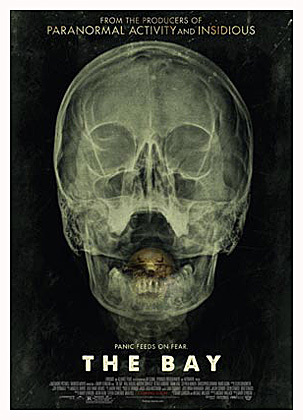 The first act of The Bay is quite effective as we follow a young reporter (Kether Donohue) who is covering Claridge’s Fourth of July celebration but, soon is there to witness what appears to be a bacterial infection breaking out and reports the story as more and more people start to succumb. But, then Levinson quickly looses his grip when the actual cause is revealed far too soon and then The Bay starts to get more and more outlandish and silly and degenerates from what started out as an effective thriller, into a found footage SYFY channel bug movie. This is a case where the found footage format actually accentuates how silly things are getting, rather then keep things intimate and drawing us in. Between the scenes of the robotic and incompetent CDC trying to figure out what is happening, to the oft captured footage of the CGI parasite in question crawling out of the victims bodies, it just becomes a silly killer bug movie and loses any tension or suspense the first act started to build. There are a few effective moments amongst the schlock and some very gruesome ones too but, it’s not enough to keep this found footage horror afloat. Another thing that really hurts the found footage effect is casting Kristen Connolly who became a household name to horror movie fans a few months earlier in Cabin In The Woods. It ruins the effect that this is supposed to be real footage we are watching. We know she is an actress. On a technical level the film is well made and is mercifully short at 85 minutes so, at least there is that. The cast all try their best to make this all seem real though there are some weak performances from some of the secondary characters. And while they do a decent job, the material just gets silly and they can’t overcome that an engaging thriller degenerates into a routine killer bug movie complete with CGI critters. That and the already mentioned casting of a familiar face in Connolly in a film that is supposed to be trying to pass itself off as recovered footage, causes it to just fall apart on those actors trying hard to make it work. Overall this film is a big disappointment. It stars out really good and had me hooked but, dropped the ball by revealing it’s culprit far too soon and then going from inventive thriller to routine eco-horror/bug movie. The found footage gimmick falls apart with the casting of a familiar face and the scenes of the CDC trying to cope with a problem out of control are borderline comical and not fear inducing as they should be. A good start that spirals into an epic fail. I know a lot of people who like this movie so, if it sounds intriguing to you, check it out. It didn’t appeal to me but, got generally good notices and it may be more to your liking. It just didn’t work for me. 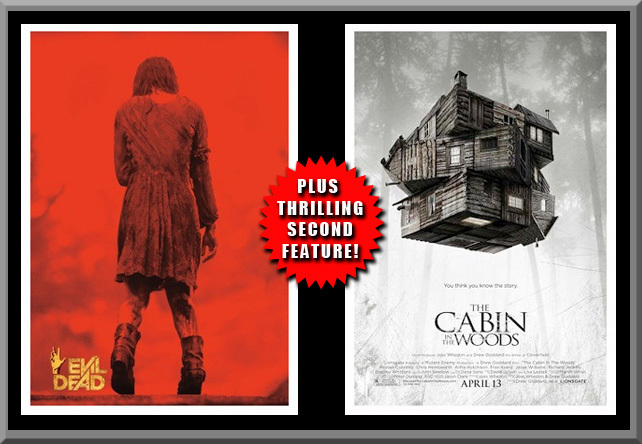 The Cabin In The Woods was originally filmed in 2009 but, wasn’t released due to financial problems at it’s original studio, MGM. The film was finally released by Lionsgate in 2012 after an almost 3 year wait… and worth the wait it was! If anyone knows how to have fun with pop culture horror conventions, it’s Joss Whedon (Buffy The Vampire Slayer, The Avengers) and he and Director Drew Goddard craft a fun-house of a horror movie by doing just that…and we are happily along for the bloody fun ride. Cabin is a movie where the less you know going in, the better…so, I’ll simply say that it starts out with the classic “5 young partiers heading up to an isolated cabin” scenario and then turns this horror sub-genre into something quite different and deviously fun. 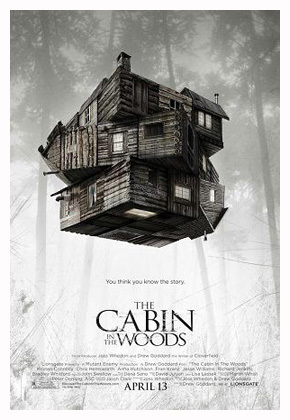 Aside from a really clever script, Cabin benefits from the fact that Drew Goddard knows how to craft suspense and scares, despite letting us in early on what is going on. We also get a bunch of likable characters to root and care for and the cast is as likable as the characters they play. This is very important to make a horror flick work and so many films today makes their leads unlikable jerks who we could care less about. We are only scared when we care what happens to the antagonists and here we do. From plucky heroine Dana (Kristen Connolly) to hunky Curt (Thor’s Chris Hemsworth) to stoner Marty (Fran Kranz), we really like all five characters and it adds to the film’s effect that we don’t want to see them suffer the fate that has befallen them. And what a clever and cruel fate Whedon and Goddard have in store for their victims. And, in turn, providing a clever and inventive blood-soaked horror for all of us. The FX are top notch and the performances from his cast, especially leading heroine Connolly, are all good and help make the wicked scenario work. The script provides plenty of scares and gore, but also gives us some tension-relieving laughs with Whedon’s trademark sly humor. Everything is blended together well by director Goddard, who gets us primed and ready for the “all hell breaks loose” final act. And that is a blood spattered treat, let me tell you! 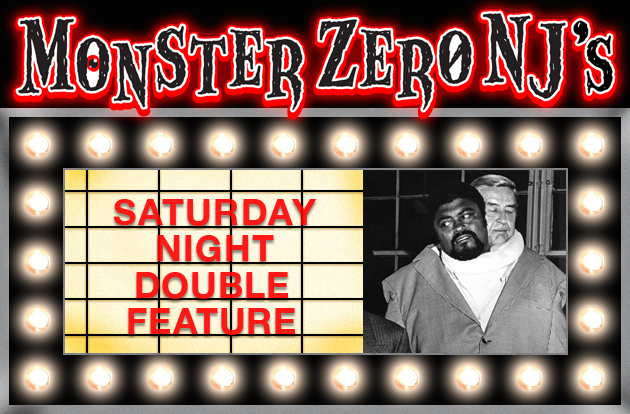 A real horror movie blast! Also stars Jesse Williams as Holden, Anna Hutchison as Jules and a really fun surprise cameo that I won’t spoil here! One of the most inventive and fun horror movies in quite a long time! Highly recommended!